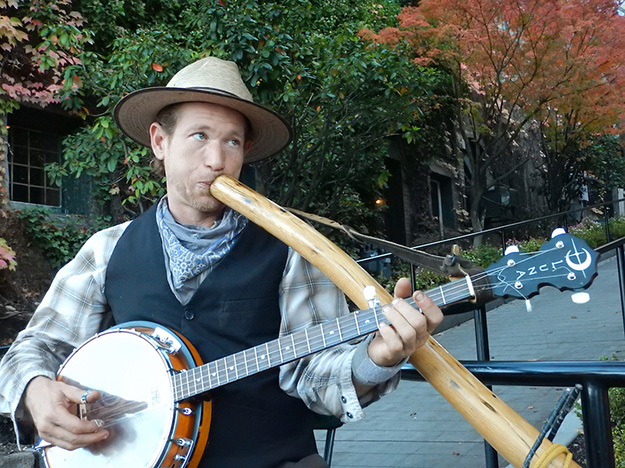 ASHLAND, Ore. – Ashland is widely known for its entertainment – primarily because of the famed Oregon Shakespeare Festival – but its variety can surprise you, too, proven by this busker’s one-man show on banjo and didgeridoo. Entertainer Marcus Fry added extra sounds with a string of tiny bells tied above one shoe and a metallic percussion instrument attached to the shoe on his other foot. His show was a guaranteed pedestrian-stopper – who wouldn’t be intrigued by the combination of the plinking of a banjo and the moans of a didgeridoo? His “stage” was down the street from the classic Ashland Springs Hotel and at the entrance to Lithia Park. The American Planning Association named the 100-acre park to its top 10 list of Great American Spaces. Banjo busker. Image by Tom Adkinson. The 2018 Oregon Shakespeare Festival seasons continues through Oct. 28. Among the productions are “Othello,” “Romeo and Juliet” and “Henry V.” A divergence from Shakespeare is a production of “Oklahoma!” Credit that one to Rodgers and Hammerstein, not the Bard of Avon.